BA University is an ongoing series on The Assemblist where we get the low down on a variety of topics from brands, buyers, and fashion professionals! This time around we're talking social media. Social media is one of the best ways for new brands and shops to get their message out to the public in a carefully curated manner (plus, it's free!). The endless possibilities can be daunting for anyone unfamiliar with the ins and outs of the available channels. We spoke with Jessica Somers of Camilla and Maria Stanley of her eponymous label about maximizing your social impact. For answers to any specific social media questions or to suggest a topic for our next BA University feature, leave a comment below! HOW HAS SOCIAL MEDIA CHANGED THE WAY YOU REPRESENT YOUR BRAND VISUALLY? HOW DO YOU BREAK DOWN YOUR BRAND’S VISUAL IDENTITY DOWN TO MAKE IT EASILY DIGESTIBLE ON SOCIAL CHANNELS? Maria Stanley: I started my brand 2 years ago, when social media was already a thing, so it’s always been a part of how I brand myself. I’m a very visual person, so it comes fairly easy to me to create stories around my clothes. I try not to overthink it, but I have to admit that I am very lucky to have a very talented photographer boyfriend who helps a great deal in creating content. Jessica Somers: Our social channel, like most brands, is our biggest audience portal. It is our voice and defines who we are as a brand. Social media has absolutely impacted how we represent Camilla. As our audience has shifted to a predominately digital landscape, we’re more considerate and conscious about the content we build to ensure its responsive on both screen and print. Our campaigns are known for their theatrical colorful escapism, so it’s important we share this across our channels to articulate our core brand aesthetic. However, there has to be a balance. This is to ensure a flow of follower acquisition and sales traffic. We do this by creating additional content that sits just under the theatrics of our campaign imagery and has a more candid, accessible vibe. We also partner with our carefully selected influencer tribe to help us generate beautiful imagery, which of course gives us a few new brand friends, too. WHICH SOCIAL CHANNELS OFFER THE BIGGEST RETURN FOR YOUR BRAND? M: Instagram has the greatest return for me. My following may be small in comparison to other brands, but quantity isn’t important to me. What’s important to me is that my followers are true fans of the collection. They own pieces and look forward to seeing what I’m up to and what’s next for Maria Stanley: the collection. It’s a more intimate approach and I like it that way. I’m not really into any other social channels at the moment - it’s too much to keep up with all of them! J: We mainly focus on two social channels, Facebook and Instagram, with plans to re-launch our blog and Pinterest soon. Facebook offers us more sales return. This is due to the harder sales messaging we send and the overall improved UX Facebook has over Instagram for online store traffic. In terms of priority and which channel we consider most when creating content, it is Instagram for sure. Even though our Facebook and Instagram audiences are the same size, Instagram is first for all influencer activity and how we determine traction with our activity and shared content. WHAT’S YOUR BEST TIP FOR BRANDS JUST BEGINNING TO UTILIZE SOCIAL MEDIA OR THOSE RETHINKING HOW THEY REPRESENT THEMSELVES ONLINE? M: Create a voice and image, and stick with it. Genuinely interact with your followers. J: Be protective by staying true to your brand. We have three non-negotiable brand pillars. All three are considered when we’re building brand collateral, content and outward communications. It’s important for brands to identify their own pillars not only for content consistency, but to also attract their desired demographic.Analyze your engagement data via social measurement platforms such as Later and be responsive by allowing the insights to creatively guide you when building new brand content. By doing so, you’ll naturally form a unique and identifiable aesthetic that your followers will grow to love you for. We often hear of brands engaging with and forking out huge numbers for heavyweight social influencers to promote their brand. This approach certainly has its positives, but unless the influencer is 100% on brand, the result can sometimes be stale and contrived content. As such, only work with influencers who love your brand and sing to the pillars to which it stands for. You’ll be rewarded with powerful content for your channels and will also form loyalty based relationships with up and coming influencer talent. HAVE YOU NOTICED A SHIFT IN HOW BRANDS ARE REPRESENTING THEMSELVES ON SOCIAL MEDIA? HOW CAN BRANDS STAND OUT WITHOUT GIVING INTO TRENDS? M: I try not to pay attention to other brands too much. I admire and follow those who stay true to themselves and are consistent. Stand out by staying true to your voice. J: We’ve certainly seen a divide between Instagram and Facebook channels. Instagram is used to tell a brand narrative; it’s where all the cool kids are hanging out and brands can have more creative freedom with their posts. Facebook tends to act as the strategic news room keeping us updated on brand news, sales and product pushes. 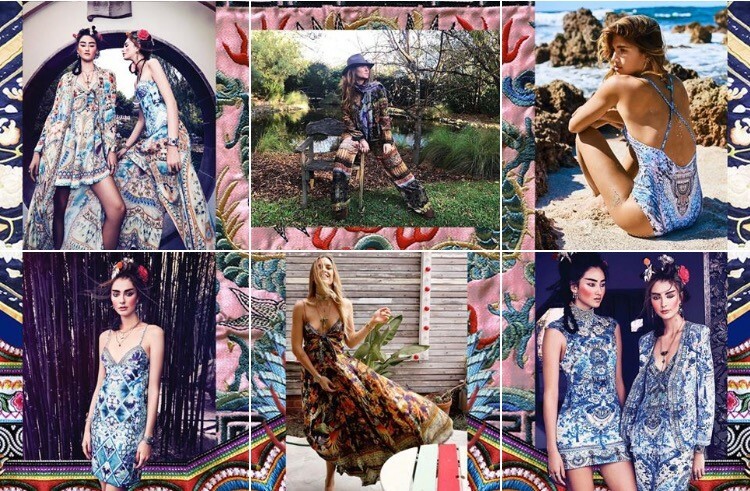 There are hundreds of thousands of fashion labels on Instagram now, all competing for engagement and follower tractions. So more than ever, it is crucial to have a unique and disruptive brand calling to stand out from the tough competition. Trends will come and go, but keeping true to your brand pillars, being passionate and protective about your offering, as well as committing to elevating your label through social media is something that will remain tried and true. Stick to it and never compromise!